AUSTIN, Texas — The thunder is coming roaring into Gregory Gym tonight as an eager sellout crowd awaits the elite showdown between No. 3 Texas and No. 2 Stanford. The Horns have the advantage tonight with every inch of their home turf expected to be draped in exhilarated fans clad in Burnt Orange. The home-and-home match resumes tonight after the Cardinal took down the Longhorns in three tight sets 15-25, 22-25, 30-32 Tuesday in California. Even with the loss the feeling around the Forty Acres before the match was one of confidence and understanding how to bounce right back. Texas now knows the Cardinal are going to fiercely go all-out in an effort to out-block the Horns daunting front line and scramble them around the court, as they did on Tuesday. As of now, the Longhorns are 5-0 when outblocking their opponents but 0-2 when losing the blocking battle. Stanford finished with a 10-5 advantage Tuesday. “They wanna attack us and get our hands off the block because we have a really big block (up front),” Peterson said. Immediately after the match senior Yaazie Bedart-Ghani regrouped the Longhorns and let them know that loss wouldn’t linger past walking out of the visiting locker room at Stanford. With the energy expected from a sellout crowd tonight, the match is sure to have a postseason feel well ahead of the big tournaments that await this winter. Which was still on the Horns minds going into that first match, but it won’t be at home. Freshman Logan Eggleston added seven kills and two aces, and Bedart-Ghani posted seven kills and two blocks. Sophomore Ashley Shook led the team with 33 assists, adding seven digs, two blocks, and four kills and junior Claire Hahn finished with seven digs, two assists, and two aces. Texas takes on visiting Stanford at 8pm tonight. 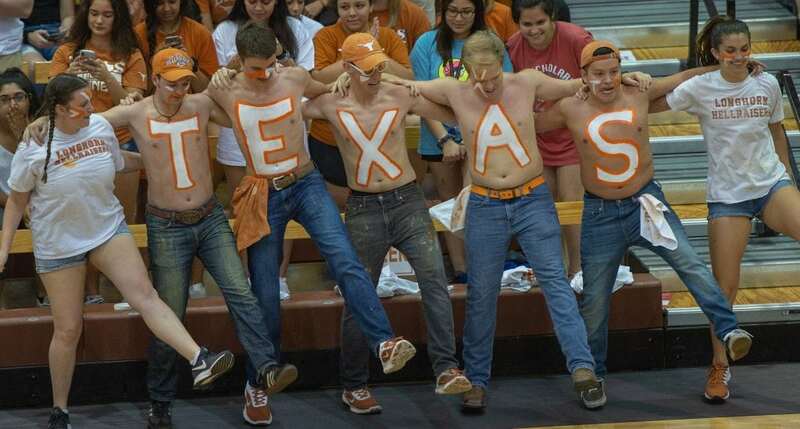 For those who missed out on tickets to the sold out game, the match will air live on the Longhorn Network as well. The first 2,500 fans get in tonight get a free Horns’ House mini flag.